Long Beach’s Aquarium of the Pacific is among the institutions seeking to write 1 million postcards to Mexican president. 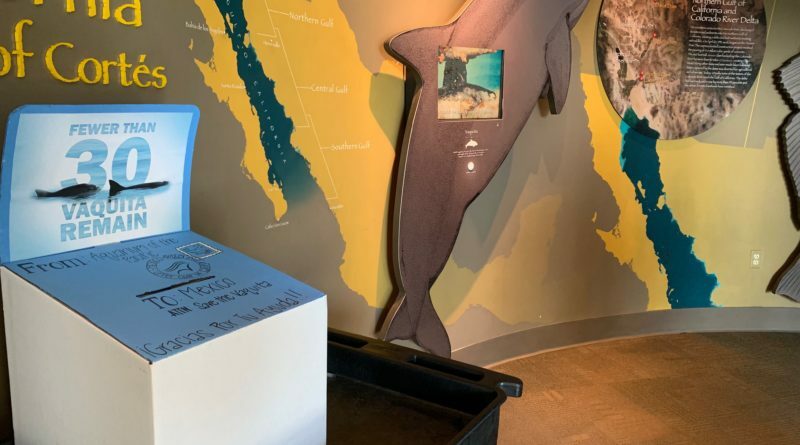 LONG BEACH — A collaborative effort is underway at aquariums and zoos across the United States to send Mexican President Andrés Manuel López Obrador a message: continue efforts and initiatives to conserve and save the vaquita porpoise population. Participating aquariums and zoos hope to deliver the collective message via one million postcards. Among the institutions participating in the campaign is The Aquarium of the Pacific in Long Beach. The campaign was spawned from continuous reports of the vaquita’s near extinction. Fewer than 30 vaquitas remain in the world, according to most estimates. Vaquitas are found in the Sea of Cortez, mostly in the upper reaches of Baja California’s northeast coast. The one million postcards effort is a collaborative effort spearheaded by member institutions of the Association of Zoos and Aquariums and part of the Vaquita Saving Animals From Extinction campaign. Visitors are participating aquariums and zoos across the United States are being asked to sign postcards, which would be sent to Obrador – who is also known as AMLO in Mexico. Obrador assumed the Mexican presidency on Dec. 1. Each institution will deliver signed postcards to Mexican consulate office in San Diego by the end of December. Vaquita Save Animals From Extinction aims to create a sustainable seafood market in the Upper Sea of Cortez (which is also known as the Gulf of California). Creating such a market would, according to a Vaquita Save Animals From Extinction statement, would benefit local communities, the economy and wildlife living in Upper Baja’s gulf coast. The initiative relies upon conservation actions, public engagement, legislation and economic development to realize its long-term mission. Joining the Aquarium of the Pacific in the one million postcards campaign were Cosely Zoo in Wheaton, Illinois, El Paso Zoo in El Paso, Texas, The Living Desert Zoo and Gardens in Palm Desert, California, Santa Barbara Zoo in Santa Barbara, California, Texas State Aquarium in Corpus Christi, Texas and Wild Lens, a nonprofit video production company. The vaquita is currently the world’s most endangered – and smallest – marine mammal. Vaquitas are on the verge of extinction due to the use of gillnets in the Sea of Cortez/Gulf of California. Gillnets are used to catch specific fish species but the vaquita are often entangled in the fishing tool. The accidental entanglements, which occur frequently, resulted in vaquitas (and other marine life) dying in high volumes. A federal court recently ordered a ban on seafood imports from the upper Sea of Cortez; the ban was implemented to prevent the import of seafood caught using illegal fishing techniques responsible for the depletion of the vaquita species. The order was upheld several times by other federal courts.